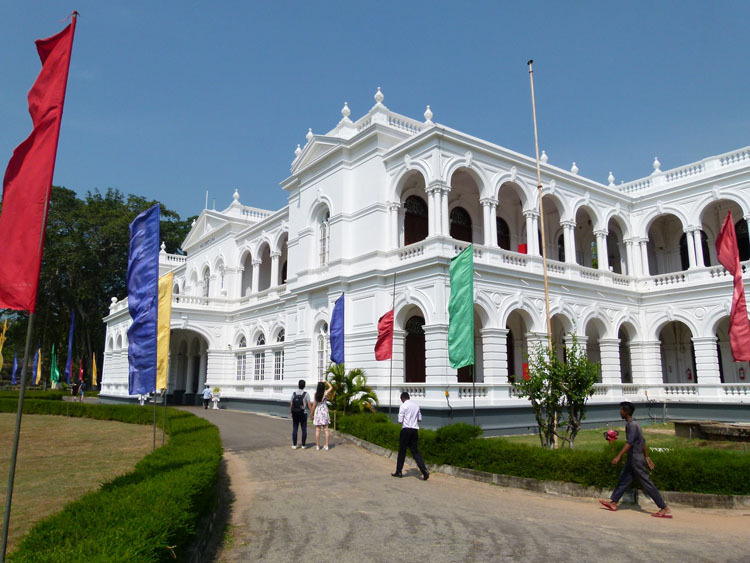 The grand facade of Colombo’s colonial National Museum. As the plane descends into Negombo, the location of the international airport servicing the country, 35kms north of Colombo, you get an excellent view of Sri Lanka’s green, carpeted hill country. Our transition to arrivals was swift as there weren’t a lot of planes at the time. We bought a sim card for $10 US dollars and got the change from $100 on our way to Immigration and Customs. That gave us enough change in Sri Lankan Rupees (LKR) for a few days. Sharyn organised an airport taxi to take us down to Colombo and our Airbnb for the next few days. You pay a little extra to use the super fast toll road ( recommended). Total price 3100 LKR ( ~20 SUD) Once you enter the city limits the traffic congests to a standstill. 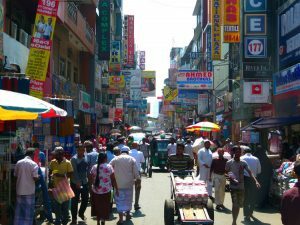 The alternative was the 184 bus to Colombo Fort and then a tuk-tuk. Or a tuk-tuk to the closest train station, a train to Colombo (if there was one!) and then another Tuk Tuk to our Airbnb. We could have saved around 10-12 USD total. We judged it a false economy seeing as we’d had a long trip, Tim was feeling very poorly, and 35 minutes straight to the door vs 2hours plus seemed like a much better deal. As we were to find out, accommodations are difficult to find, and directions are ambiguous at best, or just plain wrong. So we drove around and around until Nanda, our host, picked up his phone and directed the driver. It was down a small lane in the Colombo 3 district of Kullupitiya. We would spend the next three days at Nanda’s place while we got our bearings and I recovered from a kidney stone that had started on the plane out of Sydney and caused me no end of grief throughout our two flights and our 8-hour wait in Kuala Lumpur. 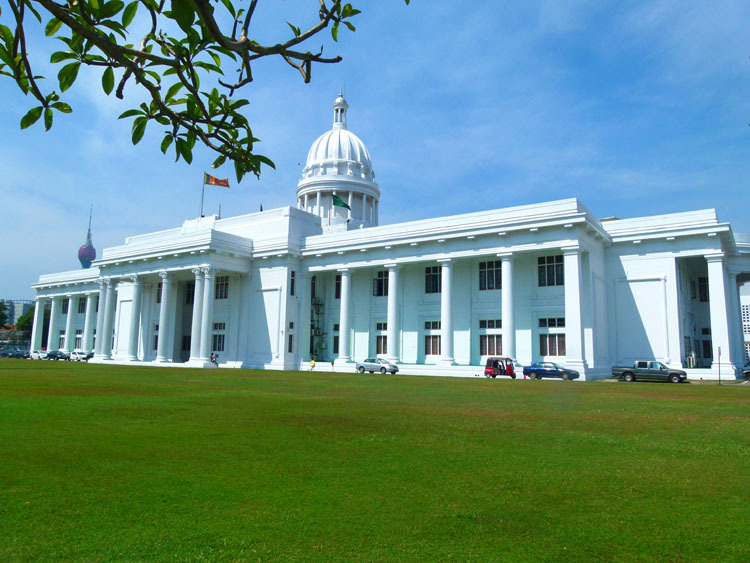 Colombo’s Old Parliament building was showing up its much younger counterparts. Apart from having a look around and settling in we needed to extend our visas to accommodate our three-month stay here, as well as get Sharyn’s International Driver’s license endorsed, which is compulsory here in Sri Lanka if you are to drive legally. Extending your visa seems to be quite a favourite pastime here in Sri Lanka as we were to find out. Just finding the place in an over-crowded, 4th floor, government office block in the outer suburbs was something of an effort, but the merry-go-round of waiting rooms and the 4-hour wait was a bit of a grind. Fortunately, we stuck with it and was rewarded with our brand new three-month visas and had one less thing to worry about. Sharyn’s Driver’s License endorsement at the Colombo Automobile Association (AA) office, on the other hand, was a breeze. It took about 15 minutes! Our business completed, we could now concentrate on the place itself. 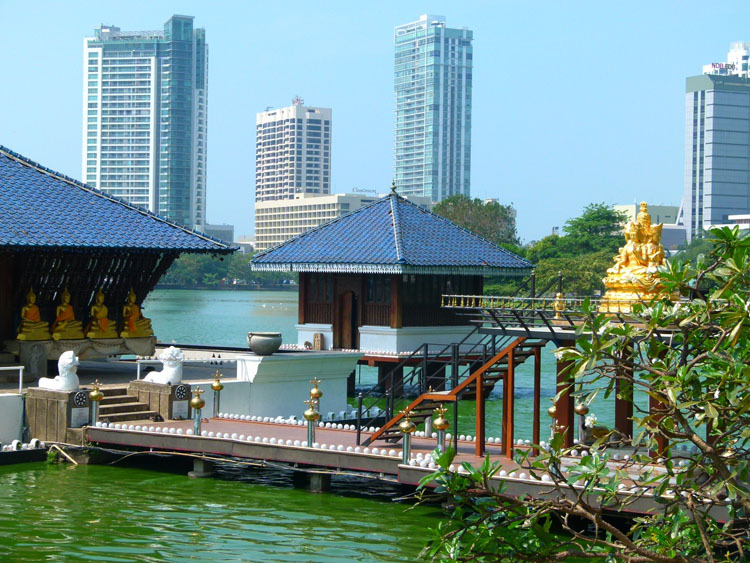 Colombo seemed like an eclectic mix of Dutch Colonial architecture, hi-rise apartment blocks and patched up canal-side bungalows. The disparity between the wealthy and the poor no different from most Asian cities we’ve visited. Notable was the fact that traffic stopped at pedestrian crossings, and there was a distinct absence of litter on most of the streets and in the parks. Recycling bins actually appear to be getting used, and we did come across an electric car recharge station and saw a showroom with electric Tuk Tuks. However, there are a couple of polluted waterways and lakes that are choked with Blue-Green Algae and are quite challenging on the nose! Always room for improvement. 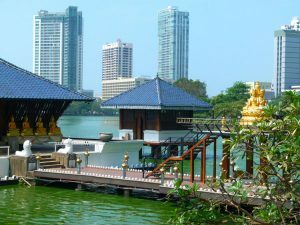 Seema Malaka temple on Beira Lake, Colombo. One thing which was apparent to us early on was that most people ate at home. There is a distinct lack of choice of cafes and places to eat. Even street food is hard to find or non-existent in most areas. This was entirely out of step with the Asia we knew and meant spending a fair bit of time wandering around looking for something to eat. We’ve since discovered that the small shopfronts labelled “hotels” serve up a range of local fare for just a few dollars, but even they are few and far between in some areas. I guess we’ve been spoiled in the rest of South East Asia. Our small journeys took us to nearby Viharamahadevi Park (across from the National Museum and Museum of Natural Science), a lovely, large green space in the centre of town full of young couples embracing each other away from the stares of disapproving parents. We gave Galle Face, an under-developed, beachside public space a miss as there was no shade and it was unusually hot. The whole Fort area is transforming and is awash with construction sites and large, ugly cranes. 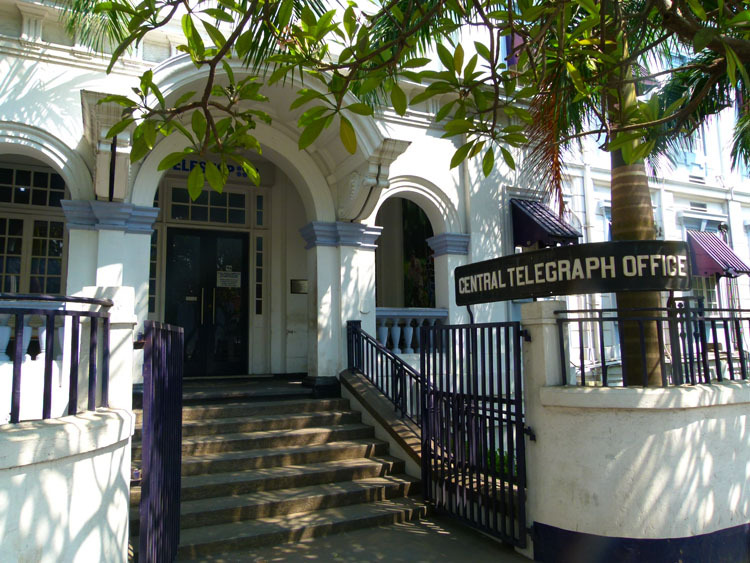 Central Telegraph Office, Pettah, Colombo 2. 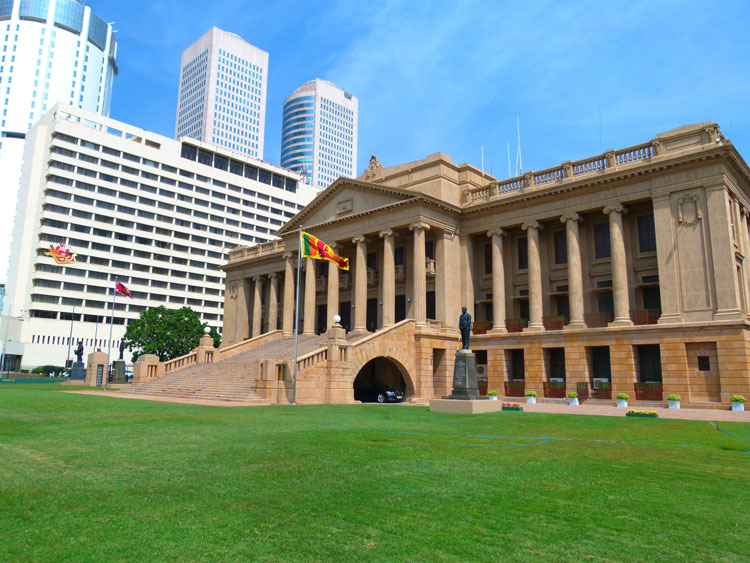 After a few nights, we moved to the Embassy District in Colombo 7, a 45-minute walk south. Here we discovered our first cricket game at the Colombo Gymkhana Club Ground, so we headed to the member’s pavilion and relaxed with a soft drink (no beers till 5 pm unless they were pre-ordered!). The game was being televised and was a pretty good standard too. We hung around and watched a couple of wickets fall, then headed off to find something to eat. 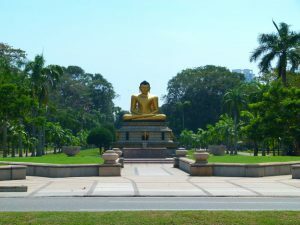 Buddha Statue at Viharamahadevi Park in central Colombo. Colombo 7 is charming and its shady streets are home to numerous cricket grounds, a testament to the country’s love affair with the game. 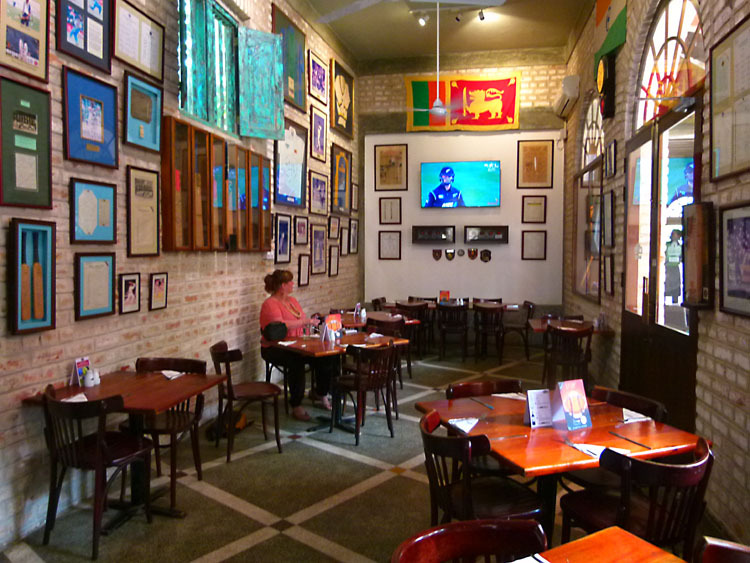 One establishment not to be missed by fans of the game is the Colombo Cricket Cafe, just around the corner from the National Museum. With draft Lion beer, excellent local and international food and an impressive collection of cricket memorabilia, the Australian-owned place is a must visit if you need to see some live telecasts of your home teams in action. 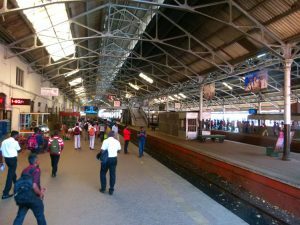 Our last days were spent visiting the congested Pettah Markets, checking out the Fort train station for timetables to Hikkaduwa and visiting the Asiri Medical Centre for scans and medications to fix my painful kidney stone problem. An outstanding experience by Asian hospital standards and we’ll relate more on that in another post. Busy market lane at Pettah. We went directly from the Medical Centre to the train as the morning spent there had made me feel better, although I was still pretty tired from lack of sleep. 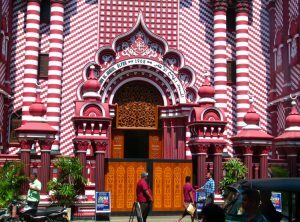 Our second time back in Colombo came as we stayed four nights just to the south, in Dehiwalla. Dehiwalla isn’t much to write home about, but our Airbnb room was probably the best we’d stayed in during our time here in Sri Lanka. We did take a trip down to tour the famous Mt Lavinia hotel and have a beer overlooking the ocean. Very Swanky and worth the trip. 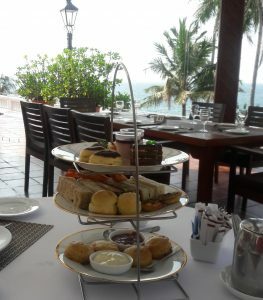 We didn’t partake but the High Tea in The Governor’s Restaurant looked particularly delicious. It works out to around 17 AUD per person. One restaurant we visited in the area that deserves a mention includes Barracuda, in a nice garden setting near the beach. Wanting to find out more about living in Sri Lanka long term, we headed up to The Cricketer’s Club Cafe (CCC) to see Gaby, one of the two Aussie owners to get some info on expats in Sri Lanka. As we loved the CCC on our first visit, I was more than happy to go back with Sharyn! Gaby was extremely busy organising staff, doing interviews with a television news crew, getting ready to take her daughter to the dentist and giving up some time to talk with us and help out. She and her husband, (name here) are both from Melbourne and used to manage the famous MCG and the Rod Laver Arena before taking over the Melbourne Airport and dragging it kicking and screaming into the 21st Century! The rightly popular Cricket Club Cafe in Kollupitiya, District 3. After a good chat and some useful info, we agreed it would be much more civilised to meet up again next week during the week when she had a lot more time on her plate. So, we had a late breakfast and a couple of ‘real’ coffees (that they grow themselves) and headed off for a walk to see some places we hadn’t seen before. 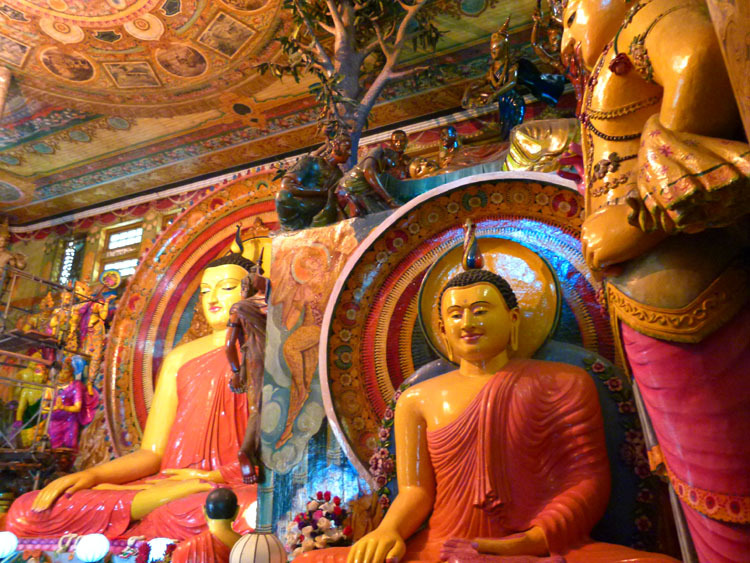 Inside the colourful Gangaramaya Temple near Beira Lake. There was no play today at the Gymkhana Cricket Club, unfortunately, so we kept walking, making our way over to the famous Gangaramaya Buddhist temple (adm: 300rps ea). The main Shrine is quite elaborate with colourful statues and frescoes and the huge Buddha at the centre. The temple is Colombo’s most important, and sports an eclectic mix of Sri Lankan, Thai, Indian, and Chinese architecture. The rambling site houses a seemingly random collection of anything from porcelain to ancient books to knick-knacks and old cars. Statues inside the Gangaramaya Temple. From the ancient to the colonial, we wandered around the still filthy and very smelly Beira Lake to Colombo’s most popular tourist attraction (for the well-heeled at least), the Galle Face Hotel. 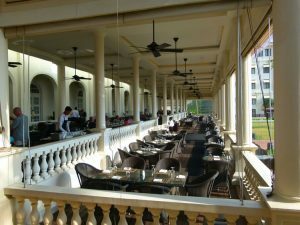 Built in 1864, it sits right on the waterfront and faces west; it is unequalled for sipping cocktails and watching the sunset over the Indian Ocean (in Colombo at least). The wide, tiled verandahs allow the ocean breeze to cool you off after a day out in the biting sun. Uniformed waiters, ever so politely, run after your every whim and every form of tax you can think of is added to your bill, leaving it nothing like you’d imagine it to be. At sunset, two kilted staff, one playing the bagpipes, proceed across the wide expanse of manicured lawn in front of the hotel and its becalmed patrons to lower the Sri Lankan flag in a ceremony befitting a colonial Ceylon. 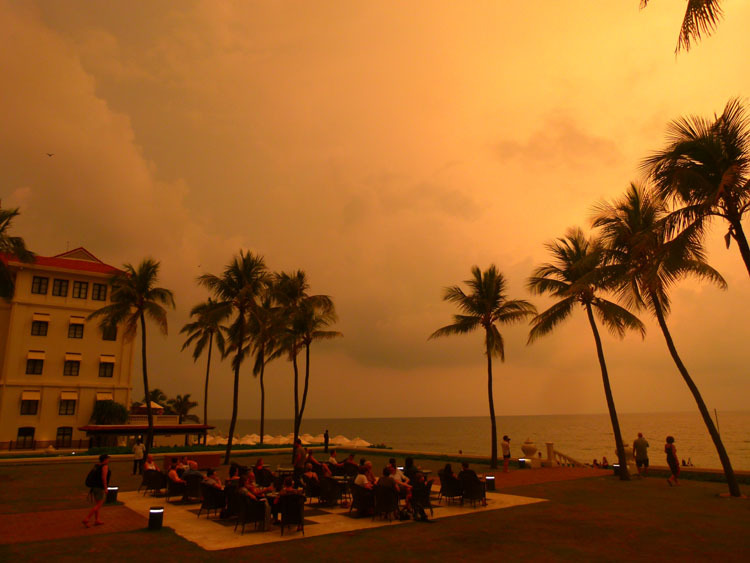 Sunset at the nostalgically colonial Galle Face Hotel. Galle Fort Railway Station, Colombo’s central station. At some stage you’re going to take a tuk-tuk, they’re unavoidable! Fortunately, Colombo is the best place to take one. They are both cheap and efficient, easily the fastest way to get around town considering the Colombo traffic. BUT – NEVER take an unmetered one! Always insist on using a meter (they are 50rps for the first km, then 40rps for every km after that). If you have no choice but to take an unmetered tuk-tuk, then you should bargain hard BEFORE you get in. Ride Sharing: UBER and Pickme are the two main ridesharing apps in Colombo. Uber makes travelling in a small air car, the same price or less than a tuk-tuk, without all the grief of haggling to use the meter. Pickme allows you to order a tuk-tuk online. At some point, the Tuk-tuk mafia is going to realize they are out of business as this new technology takes over. Unfortunately, for now, they are only in the Capital. We used UBER and all the drivers were fabulous. Accommodation – Always have the phone number of your accommodation so your driver can get accurate directions. SIM cards are cheap as are calls and data. Get your SIM on arrival and keep it topped up for these kinds of situations. Drinking in Sri Lanka is problematic, especially if you’re new here (as you probably are, because you’re in Colombo, straight off the plane!). Don’t waste your time looking for a drink in a convenience store or any of the small shops dotting the streets; they don’t have a license to sell alcohol. You have two choices. Firstly, hang out at one of the larger hotels or restaurants (and pay extra). Alternatively, find a “Wine Shop”, usually a small establishment with a green sign over it and one or two barred windows dispensing anything from liquor to beers. Hopefully, the lineup won’t be too long. Mosque in the Pettah Market area. 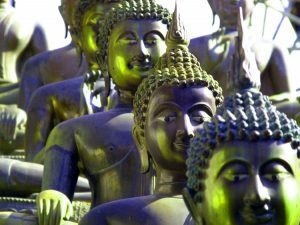 Poya Day: Every full moon (usually one a month) is a public holiday in Sri Lanka. Each of the full moons has its own name, and they are days to commemorate key events in Buddhism. These full moon days are known as Poya. Wine Shops are not open on Poya Day. Shopping on Friday afternoons can also be tricky. As many shops are owned and ran by Muslims, they close (usually till about 3 pm) every Friday as this is their Mosque Day. If you want to see some colourful Buddhist festivities, visit the Gangaramaya Temple on Dri Jinaratana Road in Colombo 2 District around 4 pm. Verandah for viewing sunset at Galle Face Hotel. If you’ve got a few spare coins at the end of your trip, you can do worse than spending them at the colonial and posh Galle Face Hotel watching the sun set over the vast Indian Ocean. Former colonials looking for some cricket action (live) and a cold beer should spare no time and head straight down to the Cricket Club Cafe in Kollupitiya, Colombo 3 District. They have great food and even grow their own coffee. Note: This post is now available as a GPS Guided Travel App. Get the most out of your visit to Colombo and DOWNLOAD it for free HERE. Next story How to travel to the Maldives on a budget and still have an awesome time!